Redbird basketball players, from left, Johnny Hill, Jackie Carmichael, and Zeke Upshaw. When the Illinois State men’s basketball team helped redesign their jerseys before the start of the 2012–2013 season, they knew what they wanted as players—and as budding fashion experts. That’s because three of the players—Jackie Carmichael, Johnny Hill, and Zeke Upshaw—are apparel, merchandising, and design (AMD) majors in the Department of Family and Consumer Sciences (FCS). Redbirds guard Johnny Hill looking at the team’s new uniforms. As well-known Redbird student-athletes who tower over their peers, Carmichael, Hill, and Upshaw would stick out in just about any classroom. But it’s even more pronounced in apparel, merchandising, and design, where they are three of only six male students—just 5 percent of the program. But they’re not complaining. Hill, a sophomore, just started the major and says he fits in because his classmates share his passion for design and fashion. And Hill has noticed that his FCS professors are big Redbird basketball fans, coming out to games and chatting him up about the team midseason. “It’s a great feeling, knowing that they’re involved and interested in something I’m doing,” said Hill, who someday would like to design shoes. 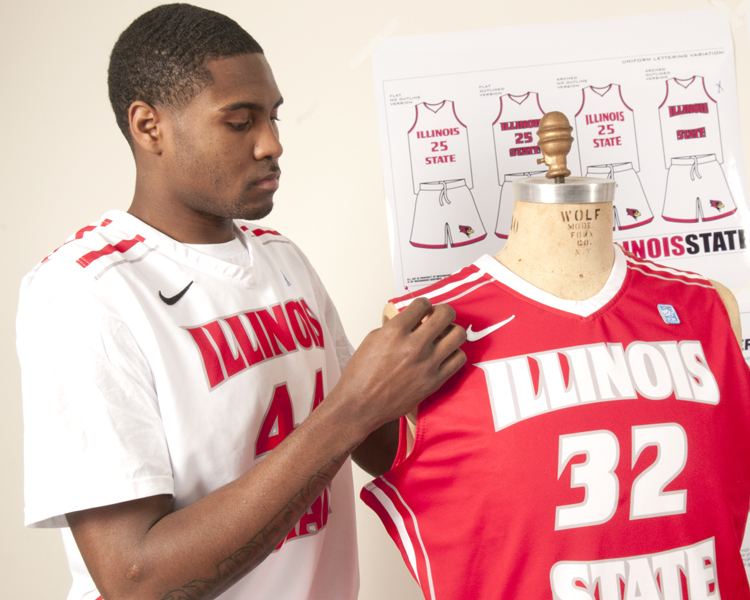 Illinois State student-athletes are studying everything from French to elementary education. But the top four declared majors are business administration, physical education, exercise science, and marketing, according to the Athletic Study Center’s most recent data from the 2011-2012 academic year. A leader on the court, the senior Carmichael also was the first on the team to join the AMD major. Like Hill and Upshaw, he was already interested in fashion and design (especially shoes) but in a different major and realizing it wouldn’t fulfill him in the long run. So Carmichael took a couple of FCS classes and ended up loving them. He was accepted into the major and later sold his teammates on it too. Carmichael’s favorite course so far focused on fashion forecasting, looking at how the apparel industry creates different looks for different seasons, years in advance, and the distinction between a fad and a trend. He’s already been through the Textiles course that Hill and Upshaw are taking during the spring 2013 semester with Professor Elisabeth Reed. Reed said Illinois State’s student-athletes are “consistently conscientious, responsible and hardworking students.” She recalled the morning in March 2012 when Carmichael made it to her Textiles class despite playing the night before at Stanford—a late game Reed stayed up late to watch herself. 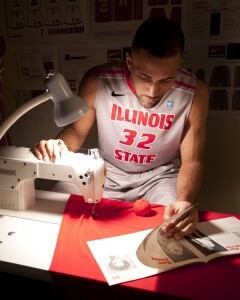 Redbirds forward Jackie Carmichael gets to work in a Department of Family and Consumer Sciences lab. “He earned a lot of respect from me for that,” Reed said. “As a Redbird basketball fan myself, I am thrilled to have these bright young men in our program. With hopes of playing in the U.S. or overseas after graduating, the FCS trio doesn’t know when exactly they’ll put their AMD skills to work professionally. But, as Carmichael says, they “know that basketball is not going to be forever.” And as Michael Jordan, Serena and Venus Williams, and David Beckham have demonstrated in recent years, an athlete’s influence on the fashion world can be immense. Upshaw plans to stay plugged into the fashion world wherever he goes. “That won’t leave me if I go play overseas after college,” Upshaw said. And while they stand out in the hallways at Turner Hall today, being one of the relatively few men entering the apparel industry after college might give them an advantage, Carmichael said. That said, the Redbird trio says they’d still like to see more men join the AMD major. “It’s great if you’re looking for something that’s going to challenge you every single day, something to make you really think outside the box and really push your creativity,” Carmichael said. Good job on the unis, guys! I like the lettering style with the sharp serifs and slight arching around the numerals, and no ridiculous geegaws like Nike or UA would throw in. Go Redbirds!